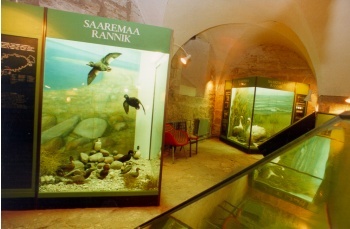 The department of Natural History of Kuressaare Museum is situated in the basement of the north-western wing of the castle. The first exhibition hall introduces the bedrock of the island, the climate and the coast. The foundation of Saaremaa is made up of dolomite and limestone – our national stone. This stone can tell you about life in the warm and rich Silurian era. The show windows exhibit several Silurian animals – corals, brachiopods, etc. Saaremaa has a long coastline and thanks to that you can observe different types of coasts: cliff coast, rocky coast, moraine, pebble, sandy beaches and fine argilaceous beaches. The windows show the life on the coast: the plants and the birds. There are some unique species among the birds like a razorbill and a grey plover. The grey plover belongs to the museum’s collection of stuffed birds from 1908 compiled by W. v. Mierzeyewski. The most numerous hatching bird of the Vilsandi National Park – the eider duck is exhibited on the rocky background of the coast. On the coastal pebbles we see a occasional visitor here – a flamingo and a more frequent migrant in this part of the world – a barnacle goose. In the second hall you can get acquainted with the relief forms and the map of the soils. The main part of the exposition is devoted to the wetlands, bogs and lakes and paludified forests. There are about 80 lakes in Saaremaa, especially in the north-western part of the island. The most interesting lake birds are the bittern, the black-throated diver and the white-winged black tern. The bittern is in the defence position and has vertically stretched out its neck and head because of danger and it resembles dry reed. The black throat diver is a rare migrant and the white-winged black tern usually does not nest here; its only nesting in Saaremaa is known from the year 1925. The most interesting inhabitant of wetlands is the wood grouse, who disappeared in Saaremaa in the 19th century. At the beginning of the 20th century it was brought in, but with no results. Recently it has started to nest here again. Among bogs the most famous is Viidumäe spring fen, which is a part of Viidumäe Nature Reserve with its territory of 1873 ha. In 1933 Dr B. Saarsoo, whose hobby was botany, found a rare plant there – the yellow rattle and it was an endemic plant of Saaremaa. The wall-board presents other rarities of the nature reserve. A separate niche exhibits the materials about the unique natural place of interest – the Kaali Meteorite Craters. The most important are the genuine meteorite pieces and the intersection of an oak tree that was supposed to have grown on the bank of the crater 1180(?) – 1430. Juniper – the most typical plant of Saaremaa is the central item in the third hall. The central show window introduces the juniper and its relationship with other organisms. The two biggest mammals of the island – the moose and the wild boar are exposed on the background of the juniper bushland. The wild boar is one of the most numerous species in Saaremaa and its population is constantly being limited. The moose rather feeds than lives in the juniper bushland. In Saaremaa you can find stunted vegetation in limestone region that is covered with thin soil; heath forests, dry boreal forests and fresh boreo-nemoral forests. 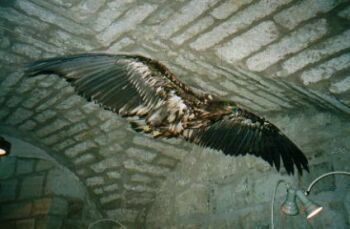 In the alvar forests on the western coast one may find a rare species in Estonia – the white-tailed eagle. This is the biggest species of eagles nesting in Estonia and about 20 pairs live here. In the juniper-hall you may learn about the so typical wooded meadows of Saaremaa. As there is very little mowing and pasturing today, the majority of them have become thickets. 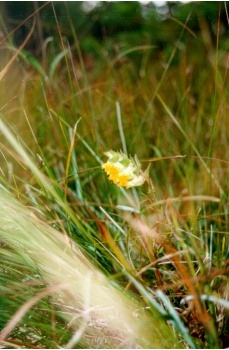 On the flowering wooded meadows you may find several species of orchids – about 34 different species altogether.